The Governance Report shifts the focus from democracy's shortcomings to democratic innovations: attempts to foster democratic resilience and to stimulate democratic regimes. The 2017 edition of the Governance Report focuses on innovative policies and initiatives meant to address the causes of the democratic malaise, to foster democratic resilience, and to stimulate the (re-)consolidation and development of democratic regimes. Aiming to shed light on how to manage and care for democracy itself, the Report emphasises solutions geared toward enhancing citizen participation and improving institutions in various contexts. Going beyond descriptions of best practices, the Report also examines the trade-offs these solutions entail and how policy-makers can make sense of them. Increasing active involvement in the democratic project—especially in places where citizens are dissatisfied or disillusioned with their politicians or political system and are disinclined to participate through voting, taking part in political parties or associations, or presenting themselves as candidates for elected office. Enhancing the voice of citizens—through not only formal democratic processes such as elections but also other opportunities to contribute to decision-making and to make their opinions heard. Bolstering legitimacy and trust in the democratic process—particularly where scepticism of traditional democratic institutions and mechanisms is on the rise, accountability and authority are in question, or political leadership seems to ignore citizens. Safeguarding institutions and ensuring the rule of law in order to maintain a balance between security and liberty, majority and minority rule, and other tensions that are innate to democracies—while also preventing, or at least limiting, backsliding and hollowing out of democratic principles. As highlighted in the Report, each innovation is accompanied by trade-offs and tensions and brings both opportunities and risks. Determining which democratic innovations might be best practice in any given context requires experimentation and adaptation. And because democracies are dynamic systems, managing and caring for democracy require constant monitoring and questioning. 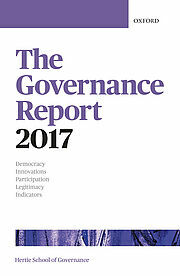 With an overall focus on ways to manage and care for democracy, The Governance Report 2017 assembles a wealth of democratic (governance) innovations throughout the book, rather than as a set of case studies in a single, dedicated chapter. These innovations—novel rules and approaches intended to address perceived and actual deficits in democratic institutions and practices—share the ultimate goal of achieving better outcomes and greater legitimacy. They aim to increase active involvement or enhance the voice of citizens, bolster legitimacy and trust in democratic processes, or safeguard institutions and the rule of law. Although most achieve their aims to one extent or another, not all democratic innovations are best practices to be replicated or have purely positive effects on democratic processes. Download an online compendium of democratic innovations highlighted in the book (PDF).